Disclaimer: This is not an instruction on how to do a Sar Pass trek. This is more about the experience of doing it. Flashback: I guess it was a year and a half back when Orkut was still used in India, one day when I logged in to my account, the updates showed photos uploaded by a friend. They seemed pretty interesting and before I knew it I was seeing each of them. They looked simply superb. The name of the album was Sarpass. That was when I first learnt of this word (I did not know what it was then). A quick talk with my friend told me all about it and I was excited. In the next 15 minutes I made a decision that I will go there soon. Did the bookings for last year but due to some reason could not go (Viral conjuctivities and change of Job being the prominent ones). I was disappointed. So here I was uncertain whether I will finally be able to go for the famed Sar Pass trek this year conducted by the YHA. Had a lot of issues (with which I am not going to bore you :P) and when my flight took off for Delhi only then did I feel that yes I am finally going to do this :). Now enters the 1st character in this awesome time I had – Nikhi… needless to say I’m the protagonist 😛 What did you expect this is my blog after all :P. I could finally go because she agreed to come with me. Nikhi had just finished her exams a couple of days back and I was supposed to meet her in Delhi from where we had a bus booked for Bhunter. As I was waiting to board the flight, Nikhi called me and asked “Is your flight delayed? The weather here is really bad”. I checked the schedule. So far my flight was in time and I hoped it didn’t get delayed for obvious reasons. Everything was going as planned so far until I was 100 nautical miles from Delhi. Due to bad weather a landing terminal was not available. And we circled for an hour in the air. The person sitting next to me was an interesting conversationalist. I forgot his name though :S. He told me about a place called Auli which is supposed to be really beautiful. This conversation has got nothing to do with the rest of what I am about to write but I wanted to make a note of it so that I would not forget the name of this place ;). Okay okay I am not going to divert from the topic now. Anyways, we landed in Delhi with a delay. I do not remember the delayed time (Damn this is what happens when you do things late!) but finally landed in Terminal 3 (Aah I remember this! 😀 ). The Delhi airport is beautiful and finally met Nikhi who had come to recieve me with her friend Mallika. We then boarded the Delhi metro (Which is a must ride BTW) and went to her hostel. Chit chatted ate maggi (the 1st of this trip though I didn’t know it then :D) and finally went to Counaught (err please bear with my spellings) place to catch our bus. After a lot of searching found it and saw that our fellow travellers were mostly honeymoon couples!!! 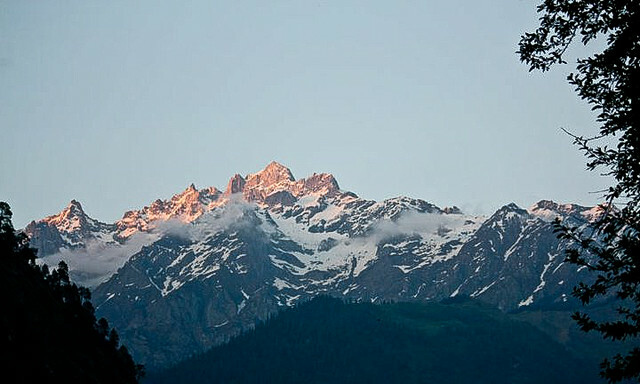 There was a slight rain in the morning and as we neared Bhunter I caught glimpse of my 1st Snow-peaked mountain 🙂 🙂 :)!!! After reaching Bhunter we got into a white coloured Jeep type vehicle in which was one of our fellow batchmates – Vikas. We behaved like total strangers throughout the journey but got talking after reaching the base camp. The scenic beauty throughout was mesmerizing. Most of the times, next to us was the roaring Parvati river. Finally reaching the base camp we saw it was located at a beautiful location(You are gonna hear this a lot now on 🙂 )and completed the formalities and went to our tents. We were dirty from the ride and it was bright and sunny but we were told we cant take a bath that day as we had come up 6000 feet in a day and our body is not acclimatized to it :O. Little did we know that this is just the trailer. Picture abhi baki hai mere dost! !